The only option for Britain was to strengthen its defences, deny German control of British skies and then take the war to the German homelands with a strategic bombing campaign. DESCRIPTION: When Germany ignored the warnings and invaded Poland, a major war become unavoidable. With the Phony War being followed by Blitz Krieg, The Germans took the Western coasts of Europe from North Cape to the Spanish border. The only option for Britain was to strengthen its defences, deny German control of British skies and then take the war to the German homelands with a strategic bombing campaign. There will long be debate over the merits and ethics of aerial bombardment but, as Germany demonstrated during the Spanish Civil War, the nation that controls the skies can take out the capacity of the enemy to resist by a combination of terror bombing and strategic bombing. Initially Britain wasted effort by dropping leaflets but, after Dunkirk, had no option but to change to bombing with ever larger fleets of aircraft, carrying ever more destructive bombs. At the start of war, the RAF had a large bomber force that was in the process of modernization. These aircraft were light and medium bombers, not much different from the German aircraft, having a relatively light defensive armament and a light bomb load. The Wellington introduced the first real strategic bomber, having a heavier armament in power operated turrets, a more significant bomb load with the ability to carry the largest bombs available or larger number of smaller bombs including incendiaries. The rugged geodetic construction enabled the Wellington to survive heavy damage from ground defences and fighters, but the breakthrough in bombing capabilities was to come with the new heavy bombers, Sterling, Halifax and Lancaster. However, the RAF soon learned that the lack of long range fighter escorts meant that the only way to achieve acceptable loss rates was to operate at night. That, together with initially poor bomb sights meant that precision bombing was not an option and the RAF became a carpet bombing force flying at night. In the early days, the RAF was particularly short of aircrew both for fighters and bombers. Volunteers were gratefully accepted from around the world. Most numerous were those aircrew who had escaped from Poland, Czechoslovakia, France, the Netherlands, Denmark and Norway, but equally welcome were those Americans who made their way to Britain to join the fight. 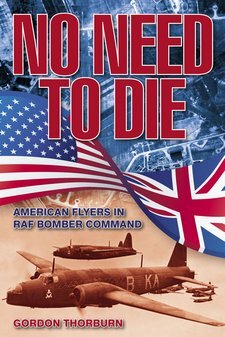 The author has chosen to follow the fortunes of 21 brave and remarkable Americans who flew with the two premier Bomber Command squadrons. Of these 21, 15 were killed in action, one of them on his first operation. One completed his 30 ops and received the DFC from King George VI. This is an inspiring and moving story of young men who, for various reasons, decided to join a fight that they did not have to join at a time when the US was still neutral.